A "fun" way to spend a Sunday afternoon is figuring out why our Maytag dish washer has standing water in the tub after a completed cycle and also doesn't quite clean as well as it used to. I cleaned the floater which felt gooey and didn't really float up and down as easily as you would expect. Didn't make a difference. When your lovely wife says, "The dish washer needs a thorough cleaning", do the cleaning. It'll save you pain like an overflowing dish washer tub later. It is not necessary to pull the dish washer out from under the counter top in order to clean the filter and sieve. Contrary to earlier dishwashers we had, this Maytag model (MDB6701AWS) supposedly doesn't need manual cleaning of the sieves and filters. Of course, that's not actually true, it just takes longer until it is necessary. 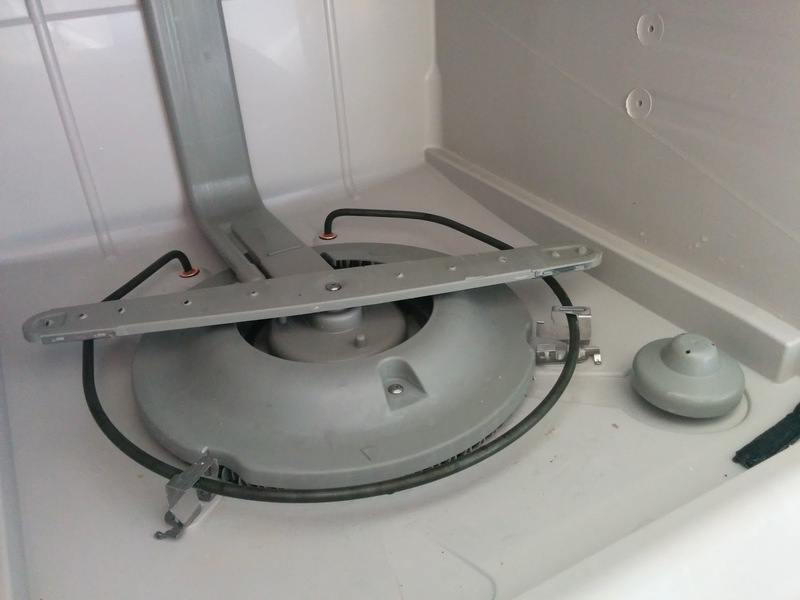 The mechanism to shred, filter and sieve food inside this dish washer is quite involved, yet fascinating. I didn't take photos when it was dirty, but I took a couple after I had everything back together. This is the inside of the dish washer. As you can see there are no obviously serviceable parts. The floater is the round thing on the right-hand side. I first removed the 4 screws circled in red to take off the sprayer arm and loosen the filter cover. Then unscrewed the 6 screws under the arm on the inside ring. 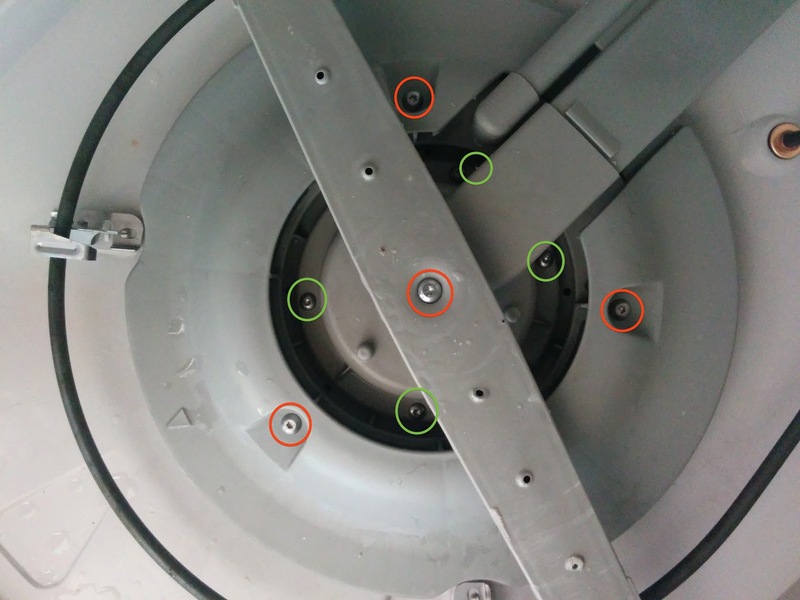 I circled 4 of those screws in green, there are two more under the sprayer arm. The middle part now comes off fairly easily revealing a black disc, which is actually part of the pump mechanism. There is a small screw on top of the disc. Unscrew that, and put the disc aside. Finally, there are two more screws holding the filter/sieve assembly in place. Take those out, too. With some gentle convincing the cover and the filter/sieve assembly can be taken out of the dish washer. Underneath you will find the blade that hacks food into tiny parts to be washed down the drain. In our case, the inside of the filter/sieve assembly was completely gummed up with food remnants. This part can not be opened. However, a little bit patience and using a shower head provided sufficient pressure to loosen the gunk through the sieve and wash it out. While everything was out, I cleaned the other parts, as well as the drain inside the dish washer. Finally, I put it all back together. Apparently I didn't break anything in the process. Our dish washer seems to be working fine again. We're running an empty cycle right now to wash out any remaining gunk. So far, so good.